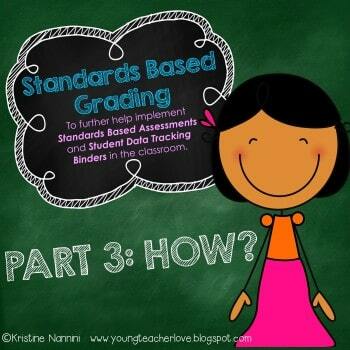 Please know that I have an entire series of blog posts devoted to standards based grading. The post below reflects my opinions and knowledge at the time this post was written. 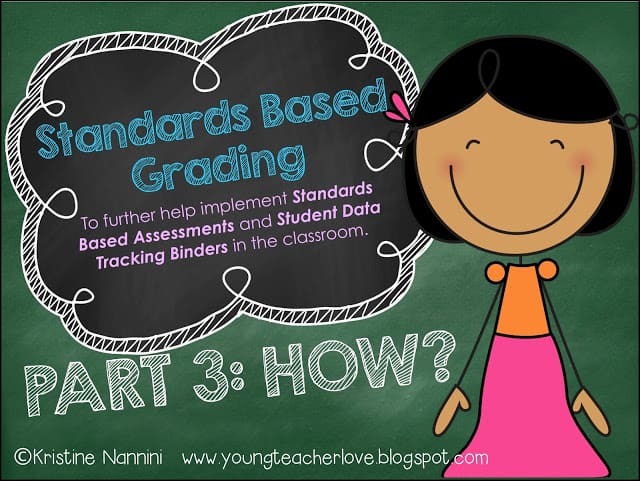 Scroll to the bottom of the post to get updated information in my blog series on standards based grading. Last week was conferences and report cards week. We started implementing a new grading program in our district (Synergy) and it hasn’t been easy. 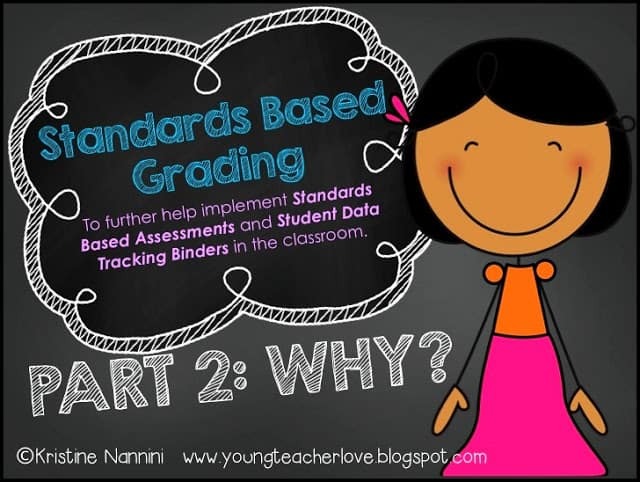 I posted a while back about how our district is moving into standards based grading HERE. I know I can speak for many other teachers in my district in saying that standards-based grading came at us quickly. Reporting back to parents has been no walk in the park. 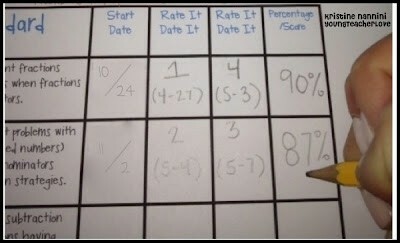 I posted in this blog post how tough (yet awesome) data tracking, standards-based grading, and quality summative assessments can be for teachers. Teachers who are used to simply assigning homework and grading it, then entering it into their grade book are in for a rude awakening. To begin with, let’s talk math since that seems to be the easiest to grade. In the past, when grading homework, I would give my students a check plus (3/3) if they got the majority of the concepts correct, a check (2/3) if they got a few of the BIG problems incorrect, and a check minus (1/3) if they got the majority of the problems incorrect and/or left many problems blank. I then let them fix the problems they got incorrect in order to bump their grade up. Really, I allow students to fix their work to show me they understand it. Some things that kept bugging me with grading were- what happens to those students who get a problem wrong because of a silly mistake when they know how to do the problem? What about the kid who knows how to do the work, but was just lazy and didn’t turn their homework in? What about the kid who gets a TON of help at home to do their homework, gets full credit, but then can’t show their understanding of the problems when asked in class? Let’s face it, grades are an essential way to communicate student progress. Grades and feedback need to be meaningful, and they need to provide relevant information not only to parents, but also to teachers for instructional purposes. The grades and feedback need to be consistent and show mastery of grade-level material. How do we do this? Through formative and summative assessments. We all know these two glorious types of assessment. Our principals, professional development meetings, and professional learning communities have engrained them into our brains. They are a necessary evil that many teachers (myself included) struggle to wrap their head around! How do I accurately assess my students to show their mastery of a particular standard in order to report back to parents (and students) their mastery of content, all while my principal and/or district asks me to keep track of the growth and data? When using our old reporting system for report cards, and my old way of grading homework, the student’s report cards showed simple percentages or letter grades on assignments, homework, participation, and test grades. Parents didn’t ask many questions because they could easily see what their child received in reading or math. But when it came down to figuring out WHAT specifically in reading or math their child needed help on, it was tough for parents to get that answer (and tough for me to figure out without filing through old homework papers, tests, etc.) Now, with the new standards-based report cards and grading, parents not only see a letter grade or percentage for each subject, but now our parents are seeing a 1, 2, 3 or 4 for each individual Common Core standard and substandard. I made sure I was prepared to report to my parents at conferences what standards-based grades are all about. I tried to have a little “cheat sheet” next me as a security blanket! Here is what I said to them in a nutshell: I explained that standards-based report cards allow us teachers to report on the adequacy of students’ achievements, as well as their attitudes, efforts, participation, and work habits. I explained to parents that standards-based grading breaks down each subject into specific elements of learning. 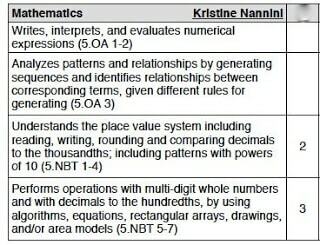 By reporting on each of these standards WITHIN each subject area, I was giving them a much more detailed description of their child’s achievement. I helped them to realize that by just giving their child a “B” in math, that communicates very little about their child’s specific strengths or learning difficulties, thus making it harder to help their child. I also told parents that in order for them to understand what they were looking at, that it was important for them to understand the Common Core Standards. 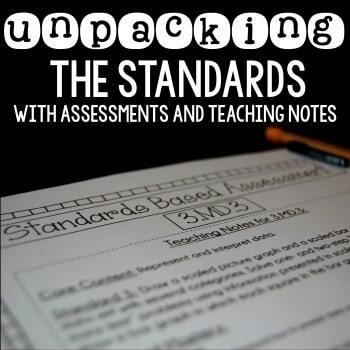 They need to know exactly what the standards mean and what each standard expects from their child. Many parents were confused at first, and at many conferences we had some laughs about the changes, but I think most of my parents left the conferences feeling much better about the 1-4 grading system. PFEW! That is why I started to implement Marzano’s levels of understanding and my Student Data Tracking Binders. It took me a while this past summer to wrap my head around it all and create them from scratch, but they have really helped me and have taken my teaching, assessing and data tracking to another level this year. The best part was sharing them with parents last week at conferences. In the past, the student’s report card would have just showed the A/B with little to no explanation (besides one from the teacher). When showing the above report card to the parents, many were happy to see the specific standards written out with the 2’s and 3’s to show their child’s mastery of the specific standard, but then I got a few puzzled looks when they tried to read the standards. Can ya’ blame them? I sometimes struggle to understand those Common Core standards! 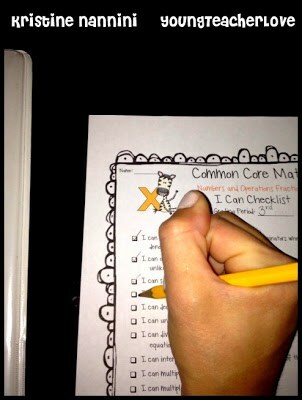 That’s when I whipped out the “I can” statement checklists from my Student Data Tracking Binders that are written in kid language! Not only did it break down the Common Core for them, but they were able to see the checkmarks from their child which showed which standards we had covered. 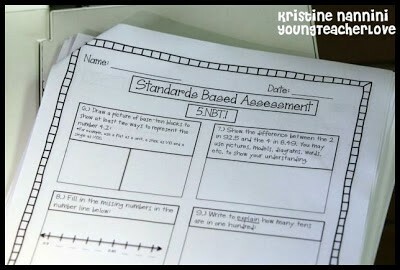 Then, I could quickly show the parents the standards-based pre-test and post-test on each individual standard. 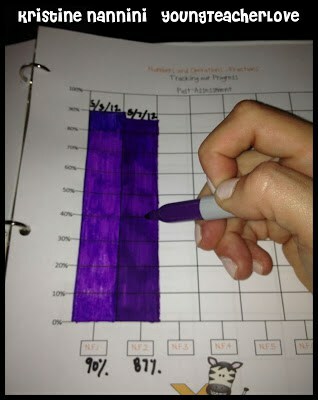 Instead of shuffling through a bunch of papers, I showed the parents these graphs to show their child’s progress!! I shared this data with parents to show each child’s ELA (or literacy) and math progress. Needless to say, the visual for parents was huge. They appreciated this meaningful feedback that accurately provided them with information on what their child was struggling with and/or succeeding in. 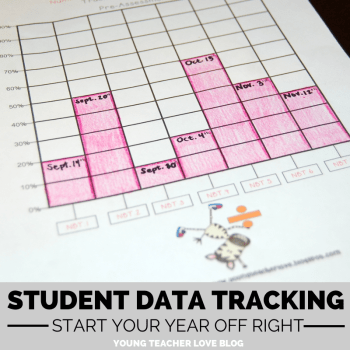 I even had a few parents who had already seen their child’s progress because I had encouraged my students to take their Student Data Tracking Binders home to share their progress throughout the marking period. Honestly, this form of feedback during conferences made for SUCH efficient reporting that it helped ease the anxieties of parent/teacher/student conferences, and it allowed more time to actually talk with parents! This is the first time I have felt this positive after conferences in a LONG time! What tips can you share with other teachers to make the process of reporting on students progress less stressful, more accurate and efficient? 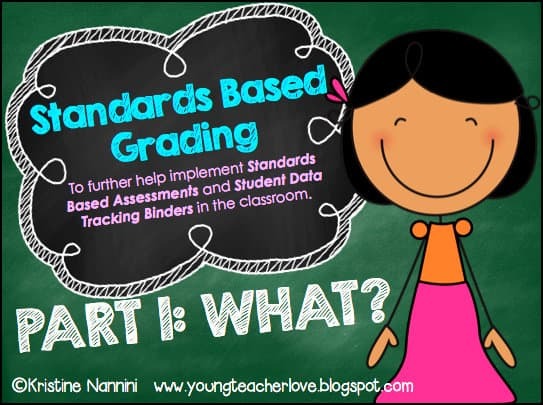 Check out my updated posts on standards based grading! 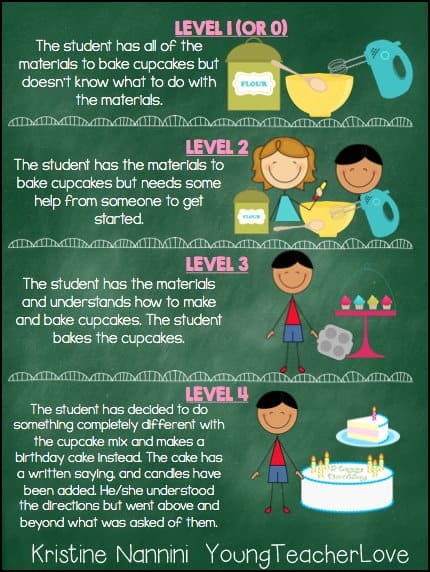 Grab this easy-to-understand visual for students and parents HERE! 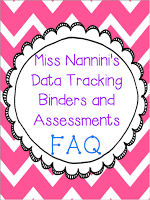 Still have questions about implementing the data binders and assessments? See this FAQ post! This is an awesome post! I’m on the report card committee for my district, and we are looking to move to a standards based report card, so this was very helpful to read. Thank you for sharing! We have been using Marzano’s work in our district for a few years and we switched to standards based reporting a while ago. I wish you the best of luck. Even with explaining the system to parents, I still have a lot of confused families who struggle with understanding the system and the core content. Would love to chat with you via email. I have found your tracking system really helpful in adapting it with our district guidelines. Thanks so much ladies. While many of my parents were receptive to these changes, I do understand I got lucky. It can be hard when parents are used to a way of doing things. Thanks so much for your comments. @Tina- I’d love to chat with ya! What a fantastic post! You’ve explained your approach so clearly and you’re right on the money about the purpose of reporting! I <3 this! I found your blog through Pinterest! I didn’t realize you were from Michigan. I teach in Bloomfield Hills. Glad to connect! Thanks so much for stopping by! 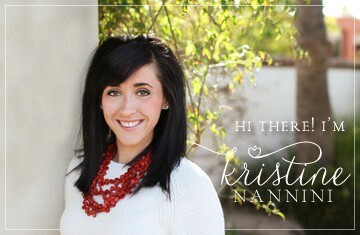 I love your blog Erin! I’m super jealous you teach in Bloomfield Hills! I live in Royal Oak but teach all the way out in Grand Blanc! I really love the way you’re involving the students in their grades. Very smart idea! I bet the kids feel really empowered knowing how to manage their own achievement! Thanks Kate! They do love it! I have said this in a lot of my posts, but it has really shifted my classroom into a student-centered classroom, and I LOVE IT!! Thanks for your comment! I am in BC Canada and it is quite different here. We have a lot of professional autonomy to grade and assess in a variety of ways and do not have many standardized tests until highschool. Still, I found this post very interesting. Thanks so much for posting! We’re not allowed to use percentages for any grading! This is amazing! I teach high school English and SO wish I could find something like this for my discipline! Way to go!